Added full support for C file scope rules. It is now possible to analyze programs in which different global variables and types have identical names in different C source files. Added support for line directives of the form “#line <num> <string>”. The Astrée server can now be started as a Windows service, making it independent from user sessions. Improved the synchronization of multiple clients that access the same analysis project on the same server. Increased speed and reduced memory consumption when handling large analyzer logs. All long running operations can now be aborted by the user. The preprocessed source code that is analyzed on the server can now be downloaded into a local directory on a client machine. The downloaded files can also be synchronized with the server files. 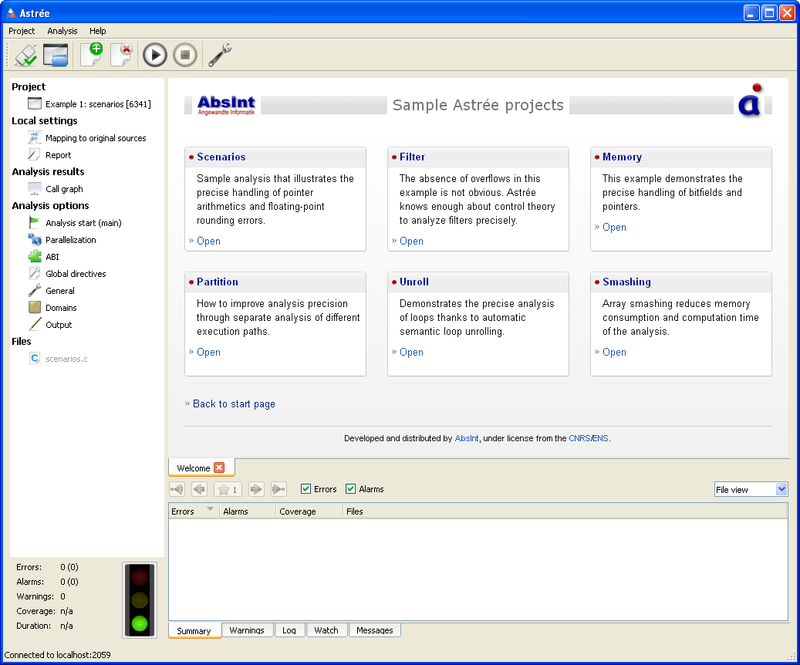 Astrée is now shipped with several pre-configured ABIs which can be loaded in the “ABI” view. Removed the separate views “Errors”, “Alarms”, and “Warnings”. This information can now be found under “Output”. 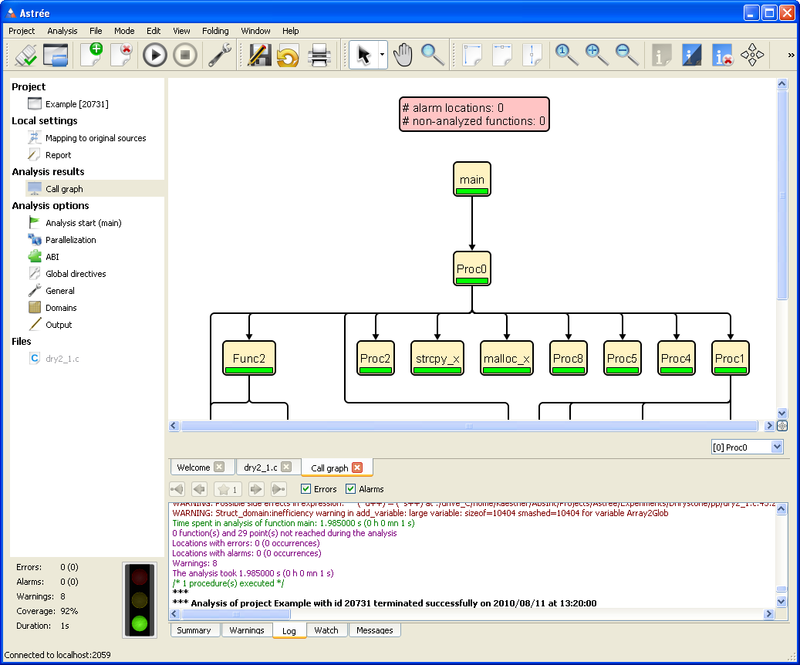 Display the call graph using the aiSee graph viewer. The graph can be used for navigating the sources. It also comprises statistical information about the distribution of alarms. See screenshot. “Output” window renamed into “Log”. Extended the “Summary” window. It is now possible to view alarms, errors, and coverage statistics per file, as well as alarms and errors grouped by categories. See screenshot. Improved the precision of coverage information. Lines outside of functions are no longer taken into account. Added a navigation panel to the “Log” and “Summary” windows, enabling easy navigation through alarms and errors. Added a separate “Warnings” window which collects all warning messages. Added new “Messages” window to display and navigate all analyzer messages for a code location that has been selected in the editor view. Added new status area below the left-hand menu. It provides stats about the analysis results including errors, alarms, warnings, coverage, and analysis time. A traffic light summarizes the analysis stats, enabling a quick assessment of the analysis results. See screenshot. Astrée now also exports invariants at the end points of blocks and functions. The exported invariants can be displayed in the “Watch” window. Loop contexts in the “Watch” window are now sorted in the order of loop iterations. Exported invariants are now also displayed as tooltips in the editor. The displayed invariants hold for all contexts. See screenshot. Non-analyzed code is always colored automatically. See screenshot. 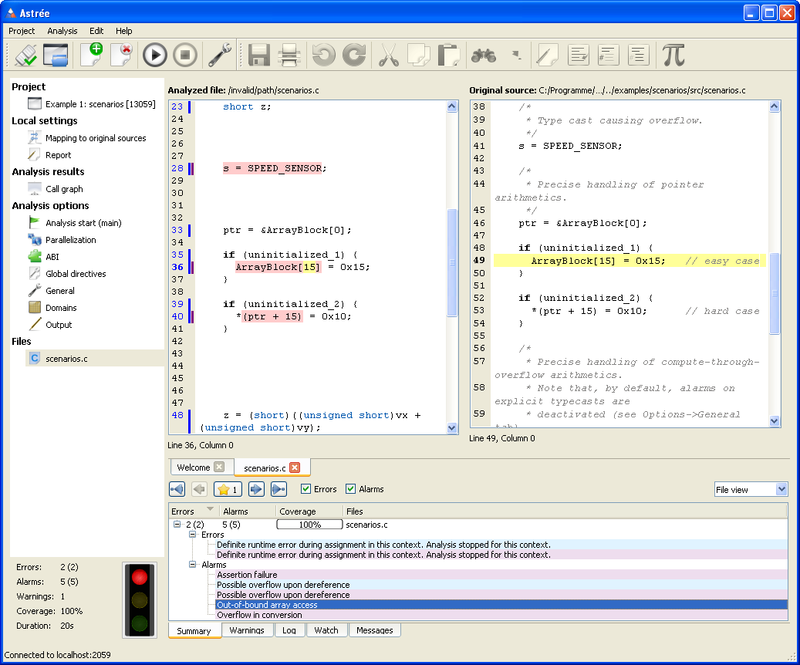 Added syntax highlighting and auto-completion for analysis directives.